The Golf Bag Cooler is the perfect accessory to your golf bag! 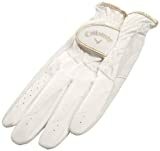 Callaway Womens Alura Glove The Callaway Womens Alura Glove comes constructed of synthetic microfiber leather that provides comfort and a Tour feel. X-SPANN2 technology produces superior flexibility and ventilation, while the hook-and-loop closure ensures a comfortable fit every time. Great Gatsby meets golf in this glitzy ball marker. Makes a perfect gift for any of your girl friends and is a wonderful tee prize. 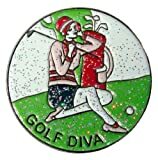 Add some bling to your game with this bedazzled ball marker. Be the jealousy of your friends as you mark your spot with this golf diva! One of our best selling gift baskets, this design is now available in Pink! There is no better gift for your favorite lady golfer than our chic pink golf bag that doubles as a fully functional cooler! This stylish accessory holds six cans, or four large water bottles ice cold for an entire day! In addition to the durable pink golf bag, we included a host of her favorite gourmet snacks and treats! Inside, she’ll find golf balls, golf tees, lemon iced tea sippers, red raspberry iced tea, our signature peach rings, key lime cookies, dried cranberries, and apple hard candies. Inside this exclusive GourmetGiftBaskets.com gift are golf essentials and tasty treats! Chic pink golf bag doubles as a fully functional cooler! This stylish accessory holds six cans, or four large water bottles ice cold for an entire day. Gourmet treats include lemon iced tea sippers, red raspberry iced tea, our signature peach rings, key lime cookies, dried cranberries, and apple hard candies. Keepsake multifunctional & stylish golf gift with treats is shrink wrapped with festive ribbon and a GourmetGiftBaskets.com gift tag. 100% Satisfaction Guarantee for you and your recipient only from GourmetGiftBaskets.com! Looking For A Gift For The Golfer In Your Life? 19th Hole Ice Balls Is The Most Unique Gift Of Any Season! Everyone knows a golfer, but what golf gifts do you get them that they have not already gotten themselves. Golf Ball Ice Balls. Not only is it great for their personal use, but its use is only limited by their imagination. The novelty of it will be the talk of the neighborhood throughout the year! Most ice ball makers create huge limited use ice spheres and you can only make 1 or 2 at a time. 19th Hole Ice Balls are golf ball sized, about 1¾ inches. This means you can use them in any glass, but you also get the long lasting, slow melting property you expect of a quality ice ball. You get 2 different colored ice ball trays so you can make a dozen ice balls at a time. Two trays, each making 6 ice balls, allows you to make 2 different types of ice balls at the same time. One ice ball mold for water ice balls and the other ice ball mold for something with flavor. NO MESS DESIGN – Features structural feet and interlocking seals on each ice ball. EASY TO USE – Quick release non-stick ice molds. Remove your ice spheres with ease! HIGHEST QUALITY – Ice ball maker made of high quality, food safe, food grade BPA-free silicone. BEAUTIFUL PACKAGING – Strong, colorful, reusable box. Ready for gift giving. Novelty golf gifts. LIFETIME GUARANTEE – Comes with a Lifetime Free Replacement Guarantee on each ice ball tray. Well, hello, ladies. The Golf Sateen Capri features practical, spiffy styling for the course and clubhouse. In short: everything you need in a golf pant. (Cue golf clap.) Our designers built these tech pants with an exhaustive attention to detail, from the sweat-wicking, UV-blocking fabrication; to the eco-conscious production process; to the grosgrain tape at waistband for a belt optional finish. 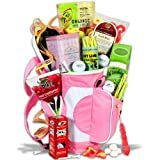 Find more Golf Gifts For Women products on Amazon!